Years ago, I used to waste time playing computer games. I used to say God was speaking to me. Probably trying to tell me that I have played them long enough. During those days, I didn’t accomplish much, because I didn’t know what I should be doing. Believe me, when you’re clueless about what you should be doing, there is nothing for you to accomplish. I could tell you that I’ve stopped playing computer games. That’s far from the truth. I will never stop playing them, but I can’t play them all day long. I have to have balance in my life, because now I have some things to accomplish. Computer games were a legitimate excuse for me not to do what I know I needed to be doing, or possibly I was just too afraid to do them. If there is such a thing as a legitimate excuse, because when you are just wasting away time, there is no excuse. My time was wasted, because I was clueless about what I wanted to do. So, it was easier to deceive myself into thinking that those computers games were really teaching me something. At that time, I was somewhat delusional. Looking back, they actually were teaching me some things. Any game you play you have to have a strategy to win. You have to be strategic or you are just aimlessly playing a game. If you never take time to know how to strategically play the game, you are just wasting away a lot of time. Regardless of the games I play, I am always trying to figure out the nuances of the game that will enable me to win. Every game has a strategy. Even the game of life has a strategy. Each of us must figure out what is the strategy to win. Interestingly enough, many of the rules for winning has been given to you. We have an awesome playbook that provides precise instructions. Unfortunately, the majority of us don’t take time to actually read and learn the plays. Plans, goals, objectives, strategies and tactical maneuvers, even in our lives, are what makes winners. Diligence play a critical role in your success. You see, all those hours I wasted playing games, I was developing a skill called diligence. Every day I played those games, I learned how to win. Although in many instances I was playing against myself, I would meticulously assess each play that computer made. This enabled me to win when I played humans, because my diligence in playing them every day enabled me to discover the strategies to win. The game of life is no different. Diligence, perseverance, consistency, determination and relentlessness are the cornerstones to winning. When you make a commitment to win, you also make a commitment to do what you need to do every day to win. Winning is not an overnight sensation, nor does it suddenly happens. Winning is a very methodical approach. Ask any Olympic gold medalist. They became winners the day they made a conscious decision to do whatever it takes to win. Regardless of the sacrifices, they were willing to endure in becoming an Olympic gold, silver or bronze medalist. For every business, career, book or whatever your heart’s desire, you make the decision to win when you make the commitment to put in the time. If you don’t put in the time, you won’t experience the win. Most people want the dime, but don’t want to put in the time. If you do the time, you will receive the dime. You have to plan to win, or you plan to fail. This is what I learned from all those hours of playing computer games. Steadfast diligence in doing what is needed every day pays off big time. The only way I mastered the games, I played every single day. I master my life by waking up every day to play to win. It forced me to analyze my strengths and weaknesses, develop strategies for my life that causes me to win every time. In doing so, I am able to know what works and what doesn’t work for me. Every lost, or failure, taught me how to be a better winner. I didn’t just lose, but I analyzed the lost, took what I needed to win and tossed the rest that would prevent me from winning. Appreciate and value my competitor. Without the competitor of the computer, I would not know how to win. I took advantage of its ability to beat me, until I learned how to beat it. I learned by watching what the computer did and eventually I began to employ those same strategies. Eventually, I won more than I lost. I use that same philosophy in the marketplace. I learn from others by analyzing best practices and using them in becoming a winner. I needed to stop playing computer games and win at life. I came to realize that for me to be successful, I had to get into the game with determination and a commitment to my vision, goals and strategies. I could not be clueless anymore about what I wanted to accomplish, but I had to have a clear vision with a well thought out plan for me to be a true winner. Do you plan to win? What strategies are you employing? What are you doing every day to be that winner? Why do you think Monday is so dreadful? From the onset of the weekend, most people are dreading Monday. No wonder it is so hard to wake up on Monday morning. No wonder it is so hard to get moving. What if, just what if, your perspective about Monday was transformed from that of dread into one of Monday being magnificent? How much more productive would you be? How much more energy and determination to succeed would you have. 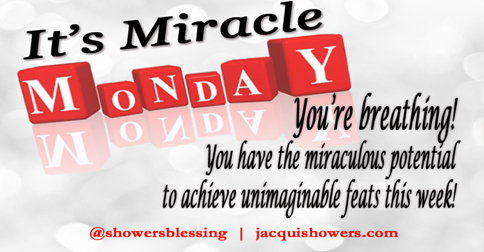 Overcome any negative thoughts about Monday you may have with a determination that you are going to Make Monday Magnificent. Believe me when your mindset changes about Monday, week-long success is evitable. Believe it or not, how you start the week can have a major impact on how you finish it. You see, if you dread Monday than it is going to have an adverse effect on Friday, because when Friday comes you can’t celebrate the weekend because you are already dreading Monday. Invading negative thoughts creeping into your weekend. If you determine within yourself that you are going to Make Monday Magnificent, the rest of your week can’t help but be magnificent. Even more, your weekend will be magnificent, because those invading negative thoughts have been harnessed to anticipate the next magnificent Monday. It flows into a magnificent week. A productive cycle embedded in success that is well worth the transformation of your thoughts about Monday and making it magnificent. Do you dread Monday? What can you do to make Monday magnificent? Leave your comments below. In a movie or theatrical performance, they search for the right person to be cast in that role. In their search they go through a process of elimination enabling them to select the right person. There are various criteria they may consider. It doesn’t have to do with rather or not they are an accomplished performer or not, as much as it has to do with if they are the right person to be cast in that role. Finally, they make their selection, because they feel they have found the right person. God, unlike man, didn’t go through a period of searching for someone to play you. He created the role of your life specifically for you. As such, no one else can play the role of your life, but you. He perfectly cast you for the part. You are not too fat…or too skinny. You are not too dark…or too light. You are not too tall…or too short. You are just right for the role God created for you. There is no one else who can be you, but you. Conversely, you cannot be anyone else because their role was created for them. In the process of creating the role for you, God also envisioned you being successful. Whatever is preventing you from embracing that success, you got to deal with it. There is no reason why you should still be wondering what to do. It is easy to know. Just take a moment and ask God. Once He tells you, do whatever He says to do and do it with unbridled passion, fervor and fearlessness. You have already been cast in the perfect role with every resource you need to be successful. Some of you are going to be entrepreneurs. Be the best entrepreneur you can be. Don’t get stuck in a job because you think that is who you are. If you are frustrated, your frustration comes from not being the person God created You to be. Go ahead and start that business. I always encourage others to go back to your childhood. The initial revelation of who God created You to be is there. In the deep crevices of Your heart, you know who you are. Believe in yourself enough to just be you. Recently, I was talking with someone who told me that when they were younger, they loved to write poetry. Even now they had poetry, books and plays inside of them. Yet, they were trying to figure out what is their ministry . . . what is their purpose. Whatever God created you to do is your ministry—that is your purpose for being. Your ministry is beyond the four walls of church and extend into the marketplace. As we talked, I explained to her that her gifting is where her ministry lies. More than likely, her writing is all a part of who she was created to be. She didn’t want to have those gifts and talents to die an untimely death and never realize their potential to transform lives in the earth. You see, every talent, skill and gift is to help someone else. Nothing was created just for ourselves, including ourselves. That is the reason God created Eve, because He knew Adam needed her. In the process of being you, know that You have been perfectly cast for the part. It is up to you. It begins with believing in yourself. Just be you! Be the best you that you can be. That is all God requires of you.